Hello Phnom Penh, the capital city of the Kingdom of Wonders, Cambodia. Promise of a mighty city with a magnificent location on the banks of three rivers. Eyes wide open, hungry bellies and ready to explore. 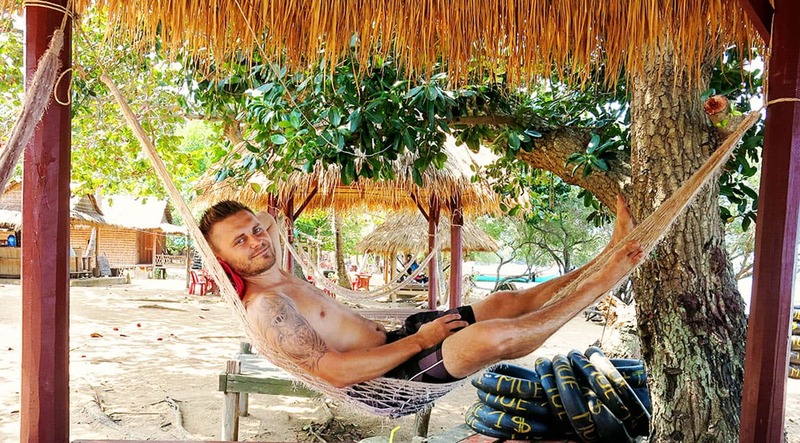 We arrived relatively early in the day (see our post of how to get from Siem Reap to Phnom Penh here) with plenty of time to take in our surroundings. Our minds prepared to intake yet another adventure. 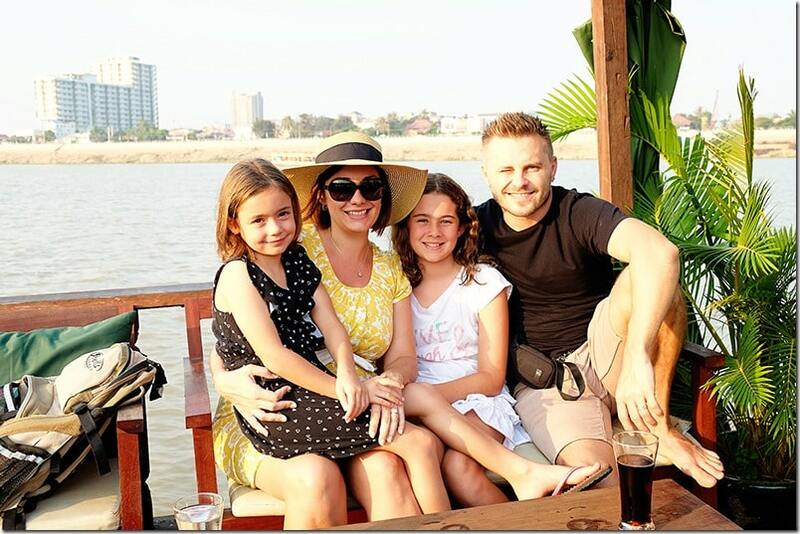 The plan was to find some yummy places to eat, check out the streets around the center of town and go on a magical Phnom Penh Cruise on the Mekong river. We have been to many cities before and usually it is a love or not-so-much-love relationship for us. 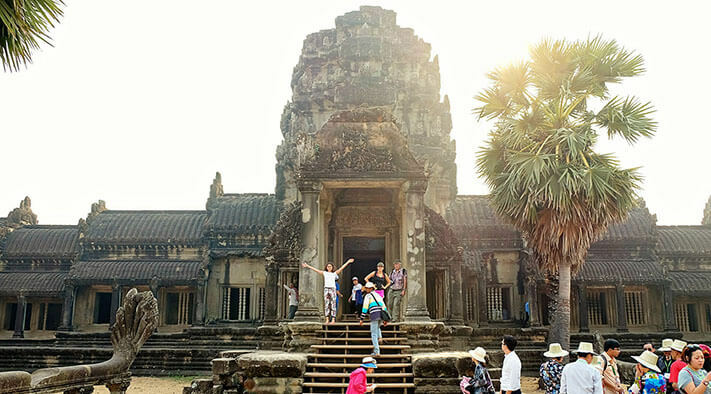 I am sure that the capital of Cambodia has much to offer for many wanderers, including museums, pagodas, temples and so much more. However our experience wasn’t that way inclined. On our short trip to Phnom Penh, we did not have an agenda to visit all of the historical sites and pretty monuments. There is so much history here and a lot the Phnom Penh attractions have to do with the recent heartaches that the country suffered. We thought that our little ones are simply not ready to learn how cruel people can be, and thought it too early to expose them to the stories and history that lies behind these sites. I think we can wait a little longer to talk to them about the atrocities of war, genocide, and dictatorships. So instead, we were left trying to find Phnom Penh points of interest that were suitable for kids. 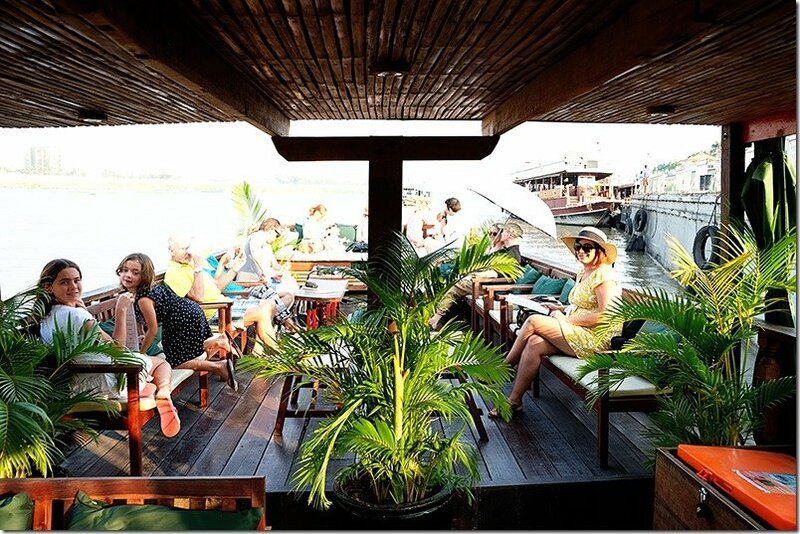 Our Mekong river cruise started at the boat pier on National Road No.5 close to the 104th Street. We were told to be there around 4:45pm for 5pm departure. 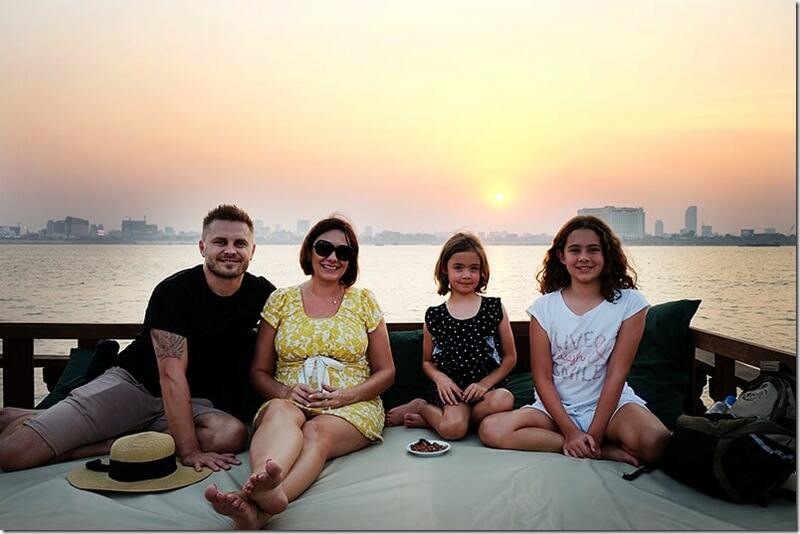 1.5hrs Sunset Cruise trip cost only US$15 and includes one way Tuk Tuk transfer from your hotel and a welcoming drink on board. 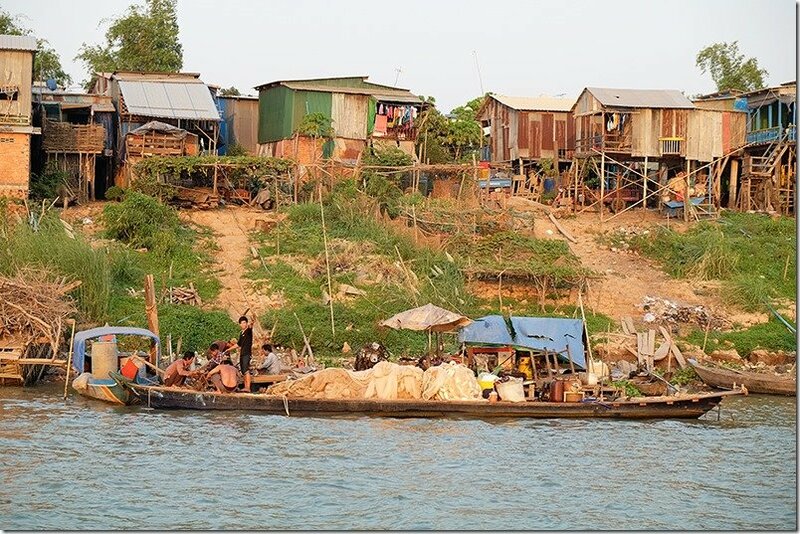 The boat takes you on the Tonle Sap river, through to the three-way intersection with Mekong and Bassac rivers, and follows a little further on the Mekong itself. 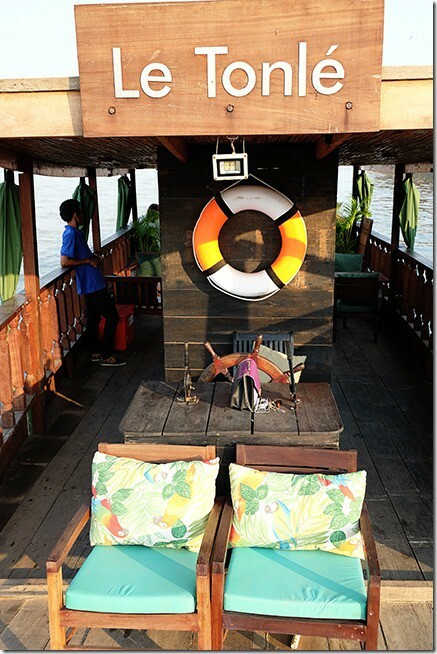 Our Phnom Penh cruise boat was quite cute and very pleasant. I think apart from the crew members there was only 5 couples and some of them with kids, just like us. Small multicultural group of people and it was nice that way. No need for crowds if you are trying to relax. We were greeted with smiles from the hostess, who quickly offered us a complimentary bowl of nuts and a complimentary drink. We were given a menu with a selection of finger food, snacks, and other drinks as well. Nice way to start the ride. The boat has plenty of seating for all the guests, however, if you get here a little earlier, you will be able to score the seats at the back of the boat. Here you can lay down, stretch your legs and forget about hassle and bustle of the busy city life. It was nice to lazy around with my wife whilst looking at Lily and Katie stare out at the views all around us. Talk about views though. We have seen cities many times, but seeing them from the water is something else. 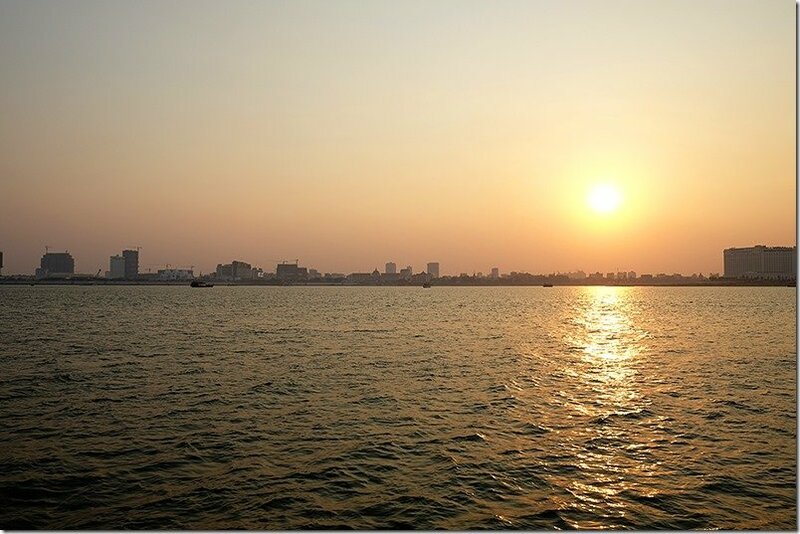 As the sun starts to set, the skyline of Phnom Penh comes a little more alive. Colourful Royal Palace, Silver Pagoda, and Wat Ounalom, give you plenty to look at when chilling out on your comfy boat. 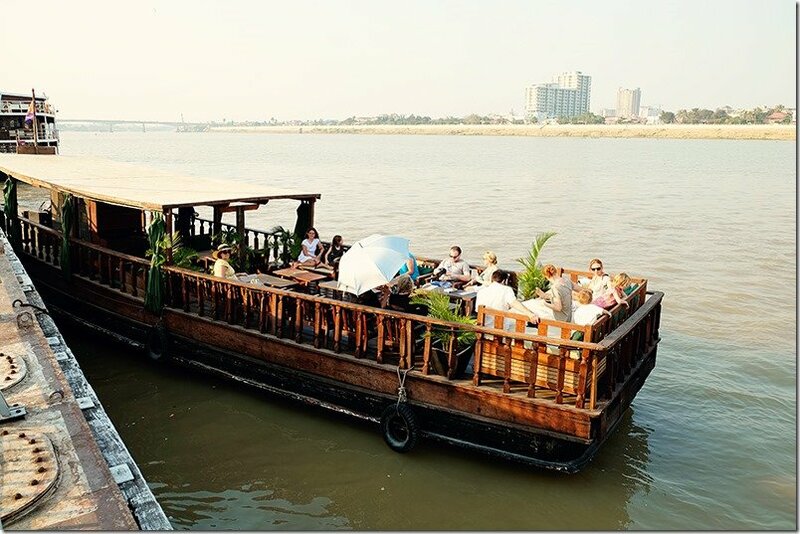 When we got to the Mekong, I was excited. I always wanted to check it out or at least to have a little peak, so I could say that I was here. We didn’t go far though. Our boat cut across to the other side for a closer look at what is going on here. Here we met with some more of the village life pictures that we had seen on the previous days. I thought that this was just another Cambodian village, but I was wrong. Our hostess was very informative all the way through our trip and she did explain that this is where the illegal Vietnamese immigrants live. 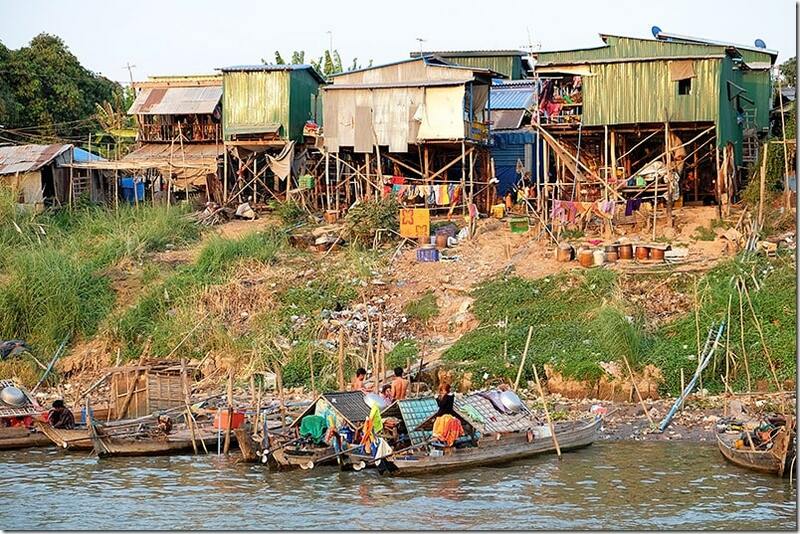 They are not allowed in Phnom Penh, but they can reside here on the far banks of the river. Well, got to say it is somewhat a weird feeling; on one side of the boat you are staring at a pretty sunset over Phnom Penh, but turn your head to the other side and you see stilted houses, fishing boats, and dirt. I don’t know if that works for the cruise or against it. Here we are relaxing with a cool drink in a nice setting, at the same time parading in front of the simple life of the immigrants. I don’t know. 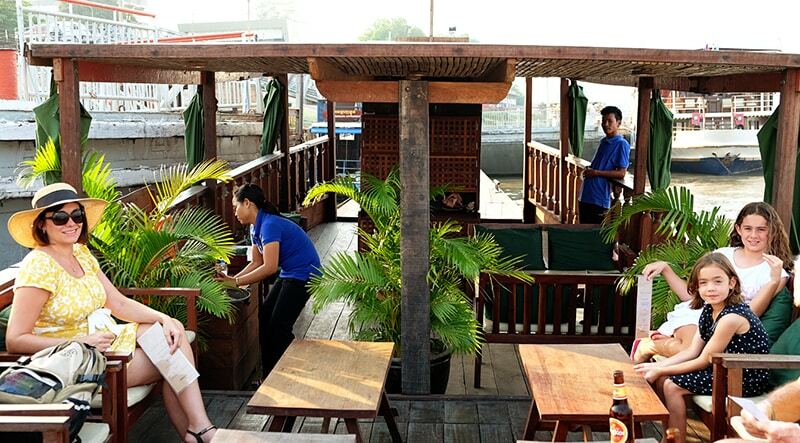 Here you stop for about 10-minute relaxation at the Sunset Bar of the Mekong Floating Bungalows. 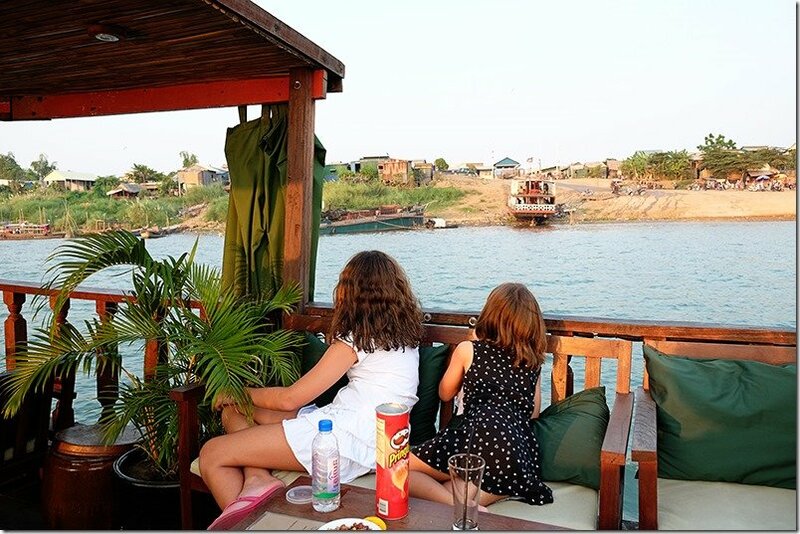 If you like you can organize a sunset dinner here and stay a little longer, whilst enjoying the calm waters of the Mekong in the afternoon light with Phnom Penh on the opposite side of the river. Not bad at all. We decided to stay on board and just chill out with our kids. 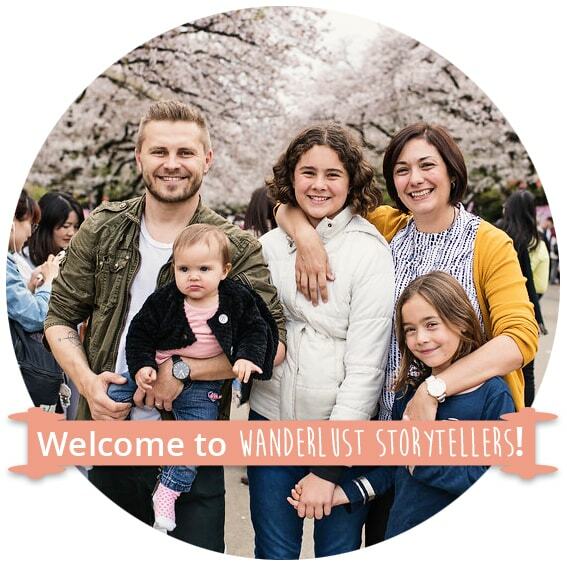 We met some nice Canadians and we exchanged some travel stories with them. It was a nice break I got to say. We snapped plenty of photos of the red sun setting behind the capital. I think Phnom Penh Cruise is a nice way to finish the day. Just a bit of relaxation is what everyone needs sometimes. I know that this wasn’t the best boat trip we have ever been on, but still, one worth going on whilst in the capital. It was a different perspective on the city and quite an informative cruise as well. Want to get out of the city? Why not take a day trip to Oudong! 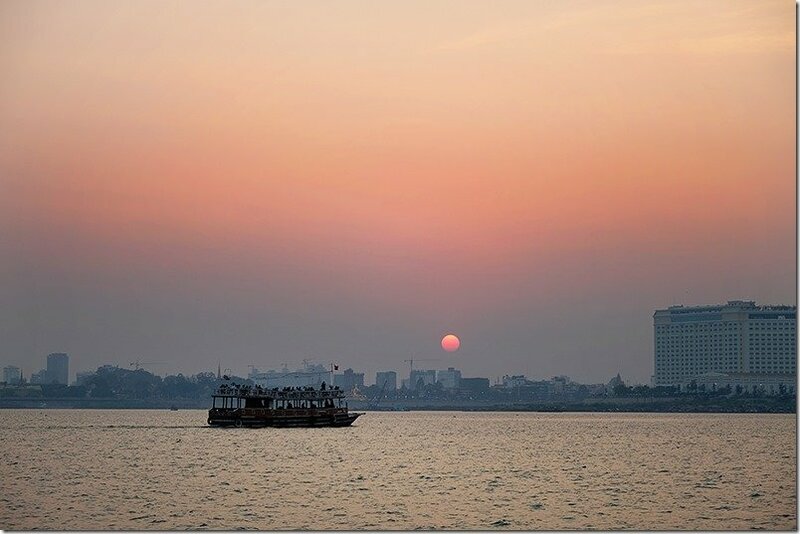 Have you been on a Phnom Penh Sunset Cruise yet? If you have, share your story in the comments below. 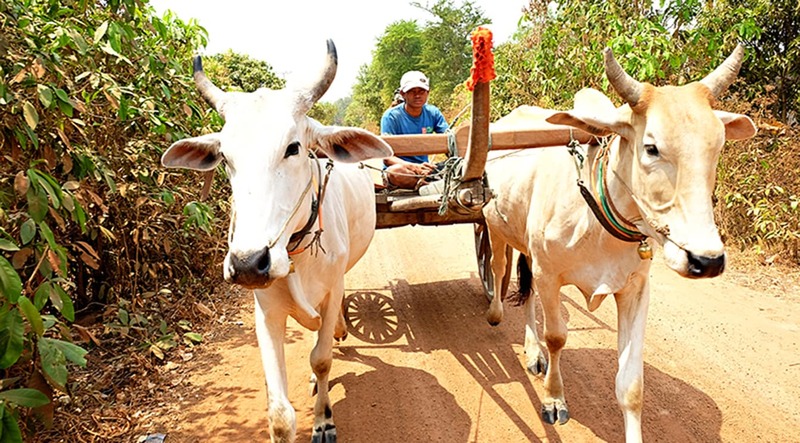 To read about how to get from Phnom Penh to Kampot and Kep, click here.